Immortality is the reward for he who overcomes the dead that walk. Another old classic from the Golden days of Games Workshop, though not, unfortunately, as successful as some of their others. 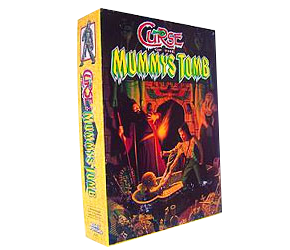 Still, it came with metal figures and a stand-up 3D pyramid board, so who cares?! Managed to trade for a 2nd hand copy of this to replace my original that I sold reluctantly years ago. Definitely one of the nicely presented games from GWs Golden Age. I’m glad to have it back in my collection.